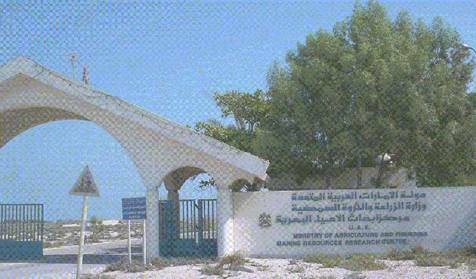 Marine Resources Research Center is located in Umm Al Qaiwain on the western coast of the United Arab Emirates (UAE) with a campus area of about 127 000 m2 facing the Arabian Gulf and is approximately 65 km from the Dubai International Airport. Experimental production of selected fish and shrimp species that are of national importance. Conduct scientific experiment and research on aquaculture and adopt a viable fingerling production technique suitable for the country. Promote aquaculture in private sector by providing technical know-how for its implementation and follow up services. Enhancement of marine resources through release of fish fingerlings in suitable coastal areas, mangrove cultivation in bare or scanty beaches to create more spawning and nursery areas and advising the government on fishing regulations for the protection of marine environment and safeguard of resources. Interaction with national fishermen by organizing fishermen co-operative societies where their problems discussed, solutions sought and awareness on fisheries regulations and norms of environmental protection are given. MRRC offers encouragement to national agriculturists to initiate Tilapia culture in their irrigation tanks by providing Tilapia fingerlings and guidelines. Publication of scientific papers and reports based on the work done at the Centre; leaflets and booklets on general information on aquaculture, fisheries, environmental protection and fisheries laws. A marine aquarium at MRRC that houses various fish and other species from the gulf waters acts as an informative and educative centre for students and tourists alike. Co-operation with other institutes and universities on mutually interested scientific studies.